We are a competitive drainage company and offer a fixed fee price cheap blocked drain cleaning service. Unblocking and drain jetting in Dublin & Surrounding Counties. Leaf 2 Leaf Landscapes specialize in blocked drain clearance. 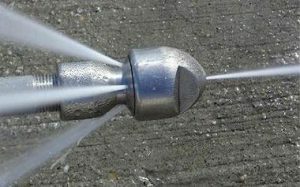 We have high pressure drain jetting units which produce up to 3500PSI water pressure at the jetting nozzle! Great for blasting through most domestic and commercial blocked drains. We also have drain rods for rodding and unblocking stubborn blocked drains, a drain sonar for tracing blocked drains, manhole lifting equipment to gain access to your blocked drain. Pulse jets, gulley grabbers and even state of the art CCTV equipment is available on request. 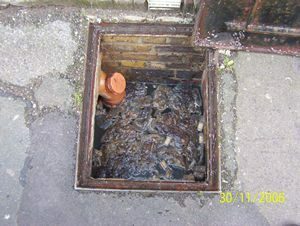 This can be used for viewing your blocked drain after we have cleared it to target possible causes and problems from which a blocked drain may have originated. We can unblock blocked drain blockages, clean drains, clear clogged and slow moving drains, unblock sewer and soil pipe drains, clean gulleys, grids and surface water drainage systems, blocked toilet drains, blocked sink drains. 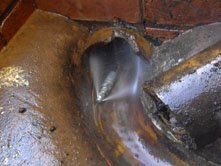 We can jet through all drainage networks and systems with a variety of drain jets. These have different heads and gauges to suit all domestic and some commercial drains. Specialist high pressure water jetting equipment used to unblock and clean blocked drains. Our jetting units can vary from between 3 to 10 gallons water flow per minute and the nozzles that are used not only clear the blockage, they will also clean the drain back to it’s full bore. This ensures your drains run freely and blockage free again! We can also use drain dye to trace the drain and make sure it is flowing as it should. In fact, the only thing that will be left dirty is our dirt cheap prices!!! Fixed price cheap blocked drains jetting, drain unblocking and cleaning in Dublin & Surrounding Counties. We charge a fixed call out fee for all our drainage clearance unlike some drainage companies who can charge over €100 per hour! Our small one off payment of €70 has no hidden extras such as call out chrage, hourly rates or VAT. Also whats even better is that if we don’t clear the blockage, you don’t pay us a single penny. **Please note, €70 fee is subject to distance boundaries, outside a 5 mile radius will be subject to negotiation of travel time and fuel/running costs. We can provide our drain unblocking and cleaning service for your blocked drains for €70 to most parts of the following areas (please call and check to confirm). Dublin & Surrounding Counties & More (call us). Call to have your blocked drains cleared today!